Social Media Management with Concepts Media Company in Port Saint Lucie, Florida 34987. Social Media Management supervises your social network, and the communications by posting new content and responding to followers and fans. 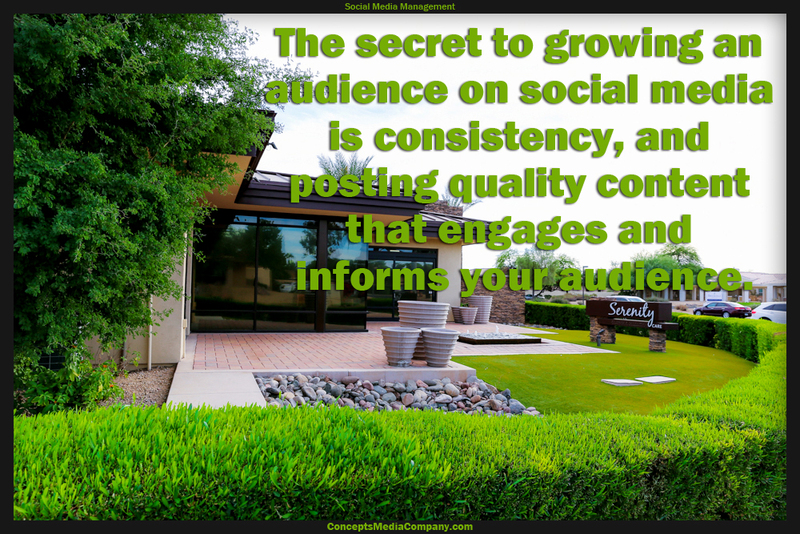 The secret to growing an audience on social media is consistency and posting quality content that engages and informs your audience. Social media marketing then compliments that organic growth, and targets your specific audiences in your demographic area increasing visibility. With Concepts Media Company providing Social Media Management that delivers online growth for your business, located in your are to provide individual in house quality work. Staying on top of your social media campaign, posting and responding to customers is very time-consuming when also trying to run and manage the day to day business. To grow a social media network you must stay consistent in your posting and maintain a 24 hour response time. With CMC handling your social media management, we can post as often as you need with high quality and engaging content. We will create video posts or custom photoblogs with our in house video production and photography team. Along with your organic growth, we can deliver revenue for your business by posting paid ads on Facebook. Giving your business exposure to new customers who may have never encountered your brand or site before, and providing an excellent return on investment for your business. Marketing on Social Media delivers the growth you want, and with Concepts Media Company located in Port Saint Lucie and servicing the Treasure Coast. With CMC we can market and manage all your social media networks and produce ad campaigns in every area and demographics. Find out more about Social Media Management for your business. Video production by Concepts Media Company servicing the Treasure Coast of Florida. Contact Concepts Media Company For all your strategic social media marketing options, and video production located in Port Saint Lucie, Fl. Helping businesses to increase their foot traffic and online visitors with the best in video production services and video marketing in Port Saint Lucie and all over the Treasure Coast.